Over two decades ago, LDAP was created as the next generation of directory services. OpenLDAP, which is an open source platform, has been leveraged to connect users to a variety of IT resources. Generally speaking, those IT resources are more technical in nature when referring to OpenLDAP. The challenge with OpenLDAP is that it is incredibly laborious to implement and manage on an ongoing basis. Recently, outsourced LDAP solutions have shifted the work associated with LDAP to a third-party provider. Directory services are a core part of the infrastructure for any organization. It is the central user database that connects users to the IT resources they need. These connections can include systems, applications, and networks. Historically, two major platforms have served as the core, authoritative identity provider within an organization: OpenLDAP and the commercial Microsoft Active Directory. While Microsoft AD found a market with Microsoft Windows-based IT resources, LDAP found a niche with Linux-heavy resources. This meant that OpenLDAP would largely be used for Linux, technical applications, and networking equipment. As IT admins and system administrators started to implement LDAP, they soon realized the correlation between its extreme flexibility and labor-intensive nature. Each type of device and application would require some tweaks before integration. LDAP was hardly a plug and play type of solution. The benefit, of course, was that the open schema allowed IT organizations to customize the directory service to their needs. The downside? It required significant expertise and time. Because it was hosted internally, it also required hardware, networking, and data center space. Authentication services are a 100% uptime task in any organization, so those activities needed to done with high availability and reliability in mind. All of this effort diverted time and money from other activities. With more services moving to the cloud and being delivered as ongoing managed services, it was a natural extension to have LDAP delivered ‘as-a-Service’. 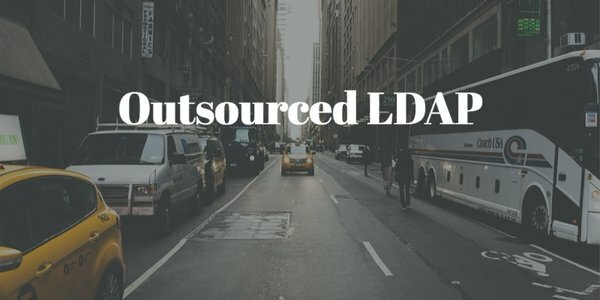 Outsourced LDAP functions much as LDAP does internally except that the work has been contracted out to a third-party Identity-as-a-Service provider. Additionally, the LDAP server is standardized for easier integration with applications. In fact, IT organizations don’t have to do the heavy lifting when it comes to integrations anymore. Many integrations have already been documented for your convenience. Ultimately, hosted LDAP is highly available, scalable, and cloud-based, so it can be connected to IT resources worldwide. If you would like to learn more about how you can outsource your LDAP server, take a look at Directory-as-a-Service. A key function of the cloud-based identity management platform is a cloud-based LDAP service. If you would like to give it a try, create a free account. Your first 10 users are free forever. If you have more questions about how your organization can shift the responsibility of OpenLDAP, drop us a note. We’d be happy to help.